With more than 925,000 people in its metropolitan area, Tucson has a vibrant economy supported by an innovative entrepreneurial community, a major multi-modal inland port, premier health care services, world-class astronomy, and a premier research institution, the University of Arizona. Tucson is a unique city, with a rich cultural heritage and beautiful vistas, surrounded by mountains and the stunning Sonoran Desert. Averaging 350 days of sunshine a year, Tucson claims to enjoy the most sun-filled days of any city in the United States. Yes, it’s a dry heat — even on the hottest days, one only need find a shady spot to feel comfortable. 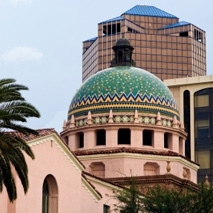 And comfort, in Tucson, is key; comfortable weather and a friendly, casual atmosphere are what make Tucson a spectacular city in which to live. Tucson boasts the best of two worlds: the progress and innovation of a metropolitan community, and the friendly, caring atmosphere of a small town. “Small town” is mostly figurative, as the city and its surrounding areas continue to grow by nearly 2,000 new residents each month, and Tucson is currently home to nearly a million people. Walking, biking, hiking — you name it, this town does it! Prevention magazine, in conjunction with the American Podiatric Medical Association, ranked Tucson 25th for cities that are best suited for fitness and walking. Meanwhile, the Men’s Fitness annual survey of fittest and fattest cities ranked Tucson as the 14th-fittest city in America. Case in point: One Tucson highlight for the health-conscious is the El Tour de Tucson perimeter bike tour. Participation in the 109-mile trek around the city has grown to nearly 9000 cyclists, including many who come from all over the world. Other Tucson highlights for the health-conscious are Saguaro National Park and Sabino Canyon, which have great hiking trails as well as beautiful desert scenery. The Arizona Wildcats have won 18 national team championships and 35 Pac 10 Conference Team Championships. University of Arizona athletes compete in volleyball, soccer, gymnastics, and softball for women; football and baseball for men; and basketball, swimming and diving, cross country, golf, tennis, and track and field for both men and women. If you happen to be flying over the city, it quickly becomes apparent — from the seemingly endless acres of brick buildings, stadiums, arenas, and playing fields, as well as a planetarium and a hospital — that the University of Arizona is the hub around which this magnificent city revolves. The University of Arizona is ranked as one of the nation’s top research universities. Optics, astronomy, biotechnology, medicine, business, and engineering are just a few areas where world-renowned faculty members share their expertise with over 34,000 students. Each year, beginning the first week of February, over 50,000 out-of-town visitors converge on Tucson to shop the world’s largest and most popular gem show, the J.O.G.S Gem & Jewelry Show. With an estimated 4,000 dealers and vendors from all over the world, hosting wholesale and public shows throughout the city, this event is the quintessential show for paleontologists and the just-plain-curious alike. Rolling in on the heals of the Gem Show comes the annual La Fiesta de los Vaqueros (“Celebration of the Cowboys”), the largest outdoor mid-winter rodeo in America. In fact, it’s one of the top 20 rodeos in North America, featuring a week of championship roping and riding events. And there’s no better way to celebrate the Western way of life than to join with 200,000 of your best friends and snag a spot along the route of the Tucson Rodeo Parade. Eighty-years-old and still going strong, this is the world’s longest non-motorized parade. big league teams play there practically every day in March. Tucson also is known for award-winning golf courses, such as La Paloma Country Club, The Lodge at Ventana Canyon, and Arizona National Golf Club. The World Golf Championship Accenture Match Play Championship is held at the Gallery Golf Club at Dove Mountain.